The long running series Batman: Black and White is still cranking along, producing some pretty amazing representations of the Caped Crusader. 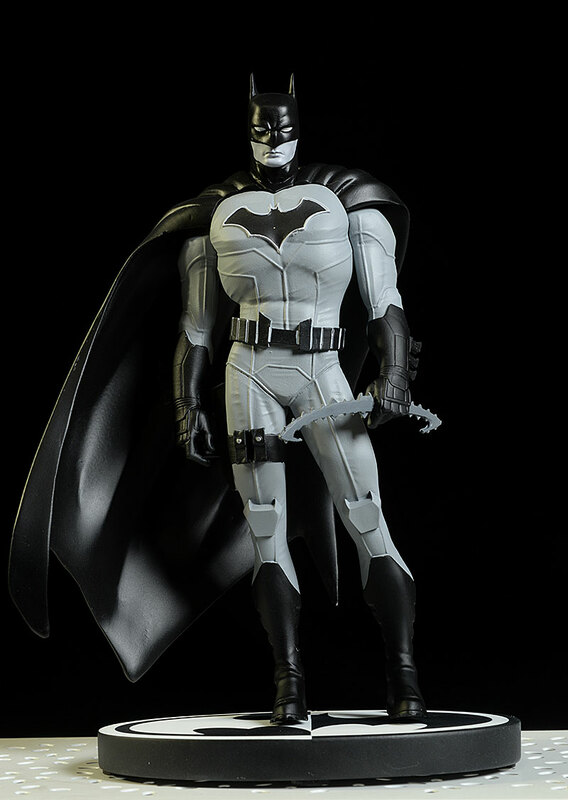 The original concept was simple: translate the style of a particular Batman artist into a 3 dimensional statue, but do it in a grey scale palette. The line has expanded a bit over the years, pulling in some villains and supporting characters, but the main theme - and scale - have remained. It's resulted in a truly impressive collection of Batmen, highlighting the diversity and creativity of the artists over the many years. 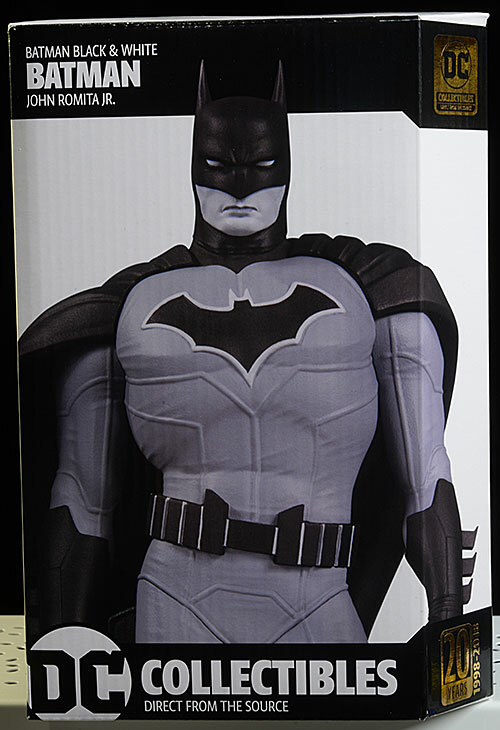 The latest release is based on the artwork of John Romita Jr. It's a 'limited' edition of 5000, and will run you around $70 at most retailers right now. A few releases ago, they made a slight change to their boxes, adding a cut corner. On this corner they celebrate a 20 year anniversary, which is interesting, but doesn't do a whole lot to alter my appreciation of the package. Thankfully, it all remains very collector friendly, and while there isn't a Certificate of Authenticity, the edition size and number are provided on the underside of the base. I like it when I'm pleasantly surprised. This is one of those occasions. I wasn't too keen on the pose and style based on the online marketing photos. Yea, it looks like the art, but there was just something about it, viewed flat on a screen, that left me underwhelmed. In hand, it's a different story. 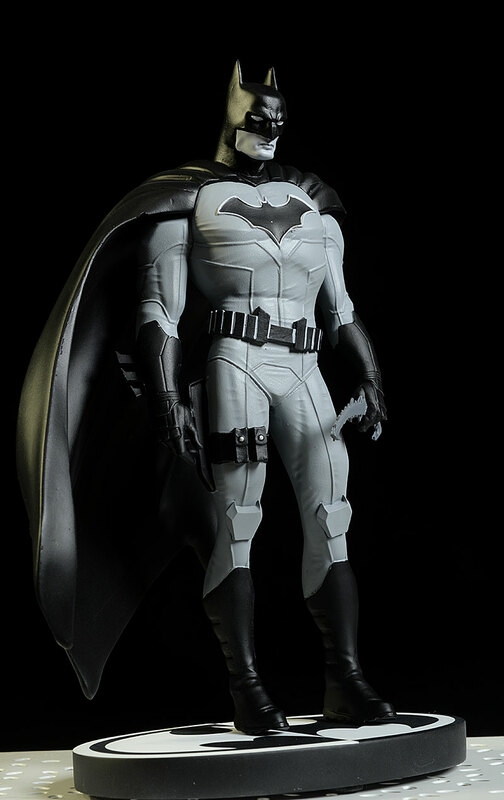 I really like the casual, self assured stance, and the dynamic cape flows nicely with the overall design. I'll be honest - he doesn't look as good in my photos as he does in hand. I don't know if there's just something about this one that doesn't translate well, or if I'm just crazy, but the final product on the shelf is far more impressive. 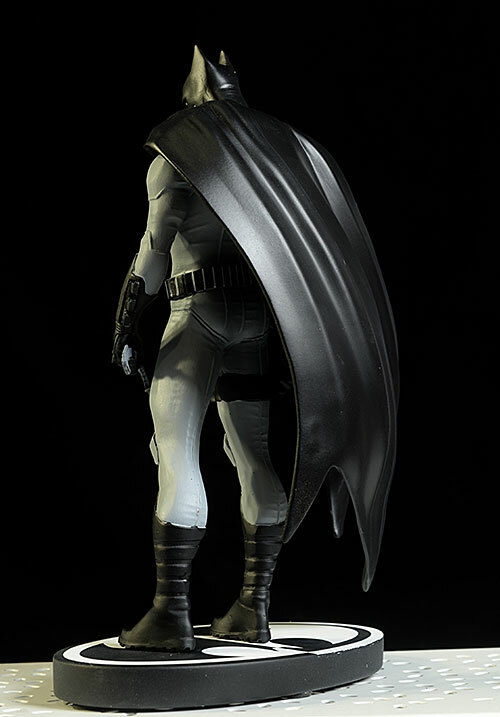 He stands over 7" tall with the base, and will fit in fine with the rest of the series in terms of scale. 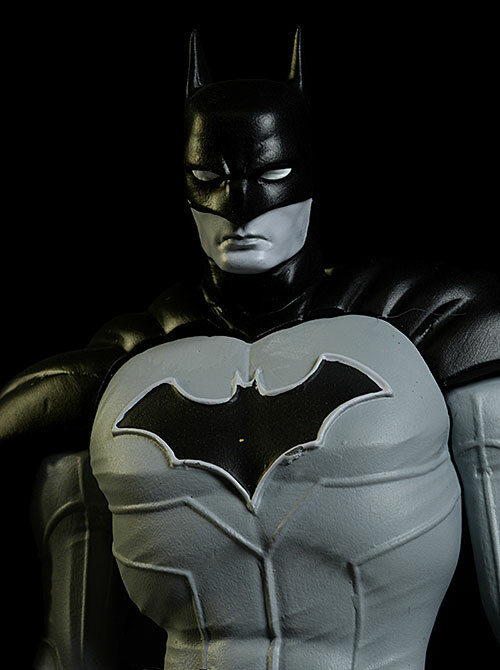 I was a bit disappointed by the paint work, but largely because of one very specific issue to my specific statue. See that white spot on his chest emblem? Yep, that's a thing. And even in hand, it's pretty obvious. Clearly, it got dinged after being painted, so the odds of them all looking like this are small. Still, mine takes a hit here because of it. There's some other slop too that speaks to generally lower quality paint operations. 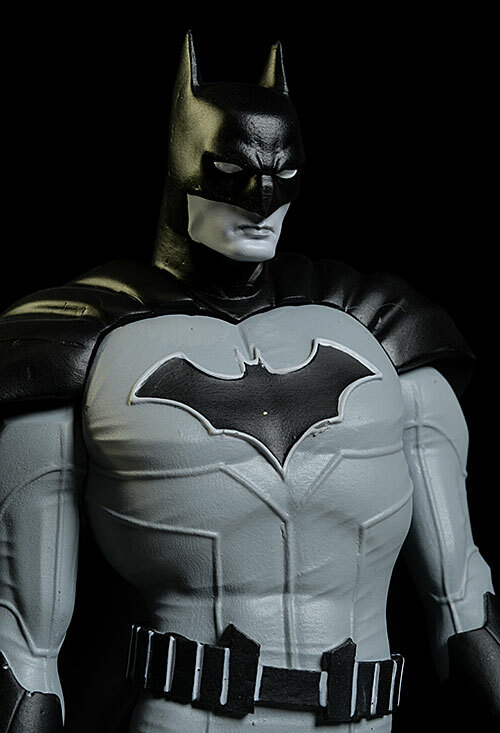 The edging around the symbol is also slightly sloppy, some of the smaller details on the belt could use some improvement, and the lips are too dark. It's not an awful job considering the price point - which you should always do - but it's still a B grade at best. Regular readers know that an average score here is **1/2, and that score means the price and therefore value inferred does not negatively or positively affect my overall. I'm going slightly above average here though, and that will bump up my final score. 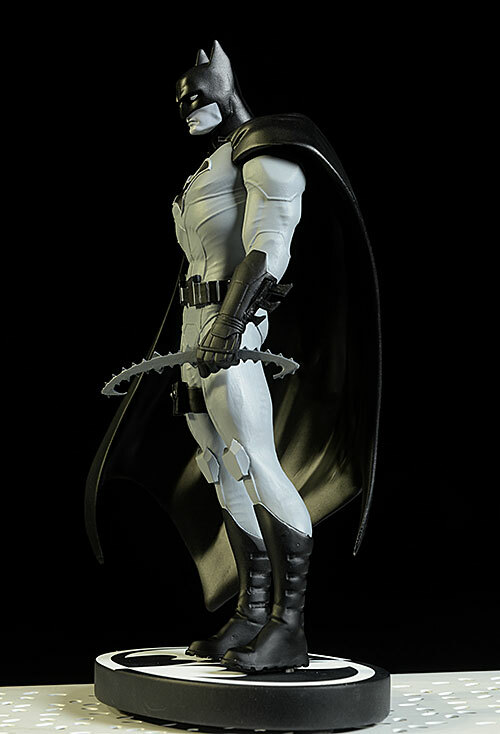 Most places are selling this guy for $70, and while the paint quality could always use a boost, you're still getting an awfully well done statue for a price that has held pretty steady for quite some time. Not much. Take some care with the funky batarang, and of course, always insert the metal peg on the foot into the base with extreme caution. With a ***1/2 in Sculpt and a *** in Paint, this guy could have swung either way in the final assessment. But that little extra boost came from the reasonable price point, shifting him closer to the high score than the low. This is a tremendous series, and one that will go down in the history books. And while some of the individual pieces are better or worse than others, it's also a series where the whole is much, much more than simply the sum of all the parts. - is also at $70. - comes in at $80. - Entertainment Earth has him for $70. 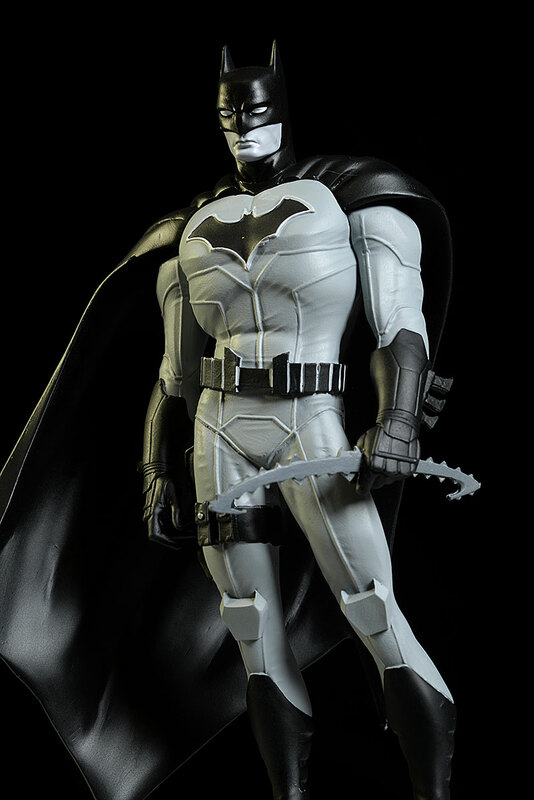 Other Batman Black and White statues include the Breyfogle, the Jason Fabok version, and the Sprang Joker and Batman. I've covered a TON of the earlier releases as well, and you should also hit the Search Reviews page to find them, or in case any other applicable reviews were done after this one was published.